Description: Shrubs, sometimes trees, bark usually smooth. Leaves mostly alternate or sometimes opposite or in whorls of 3 or 4, simple, entire, sessile to shortly petiolate. Inflorescences racemose, terminated by a dormant bud or growing on into a leafy shoot. Flowers actinomorphic [or zygomorphic], solitary in the axils of scale leaves or leaves. Tepals free but usually coherent towards the base, usually yellow and rarely with reddish markings [or green or white]. Anthers free or basally fused to the tepals [or rarely 1 fully fused and infertile]. Hypogynous glands 4 [or rarely 2], free. Ovary shortly stipitate; style not modified as a pollen presenter, stigma terminal [or lateral]; ovules 1 or 2. Fruit a drupe; cotyledons usually >2. Flowering: All N.S.W. species summer–flowering. Distribution and occurrence: World: c. 100 spp., endemic Aust., all States. Ovary densely hairy, fruit moderately hairy to glabrescent. Ovary sparsely to densely hairy; fruit moderately hairy to glabrescent. Leaves usually acute but never pungent-pointed. Tepals glabrous, 12–15 mm long; leaves succulent when living. Leaves smooth to finely scabrous; tepals without maroon markings. Leaves linear to oblong or linear-spathulate, 1.5–4.5 cm long, 0.5–1.25 mm wide. Broadest leaves >1 mm wide, mostly not terete or subterete. Leaves usually 1–3.5 cm long; inflorescences growing on into a leafy shoot with flower-subtending leaves mostly the same length as sterile leaves, or, if mostly shorter, then progressively becoming longer towards apex. Leaves subterete and shallowly concave on upper surface when living, subterete and grooved when dried. Leaves <0.8 mm wide, apex acuminate; ovule 1. Inflorescences usually 10–70-flowered; rachis 0.5–9 cm long, rarely less; leaves recurved towards their tips. Tepals with coherent apical points, not promionently distinct from the rest of the tepals; leaves 0.3–0.5 mm wide. Leaves mostly >1 cm long, linear-oblong or lanceolate to linear-lanceolate; pedicels mostly >2 mm long. Prostrate or decumbent shrub; leaves 0.8–1.5 cm long, slightly discolorous when dried. Erect shrub; leaves 2–5 cm long. Tepals sparsely to moderately hairy, the buds not usually appearing square in cross section; leaves not succulent when living, flat to convex. Bark smooth-compact; leaves convex to revolute or subterete when fresh, strongly revolute or grooved on lower surface when dried, 1.5–4 cm long. Erect to spreading shrubs; leaves concave or convex, sometimes strongly revolute but not terete, smooth to scabrous. Leaves mostly 1.5–4 cm long, usually incurved. Longest leaves >2.5 cm long. Leaves mostly broadest at or below the middle. Mature leaves smooth to slightly scabrous. Broadest leaves >5.5 mm wide, slightly discolorous; pedicels 1–3 mm long. Tepals 11–15 mm long; anthers white. Tepals apiculate to shortly caudate with terminal tails. Pedicels mostly spreading to recurved, glabrous to moderately hairy. Tepal tips acute to apiculate. Mature leaves smooth and glabrescent to finely scabrous with appressed hairs; leaves flat with flat to recurved margins, ovate. Pedicels and tepals glabrous (or rarely the pedicels very sparsely hairy); leaves sparsely (or rarely moderately) hairy when immature, glabrescent to sparsely hairy when mature. Longest leaves >11 mm long. Leaves acute, concolorous to slightly discolorous, with flat to slightly recurved margins, 1.2–3.5 mm wide. Bark smooth-compact, usually light to mid grey, sometimes dark and fissured at base or on trunk. Leaves 13–80 mm wide, ± asymmetric to falcate. Tepals apiculate to shortly caudate; pedicels glabrous, 9–23 mm long; leaf margins flat. Anthers yellow; leaves concolorous to discolorous. At least some inflorescences terminated by a dormant bud; mature leaves glabrescent to sparsely hairy. All inflorescences terminated by a dormant bud and bearing flowers only in the axils of scale leaves; leaves usually opposite; tepals densely hairy. Leaves concolorous, with slightly recurved margins. Margins of leaves ± recurved; leaves concolorous to discolorous, often broadest at or below the middle. Mature leaves smooth, or if scabrous then mostly >5 cm long or strongly discolorous or broadest at or below the middle or hairs appressed to antrorse. Tepals and young branchlets moderately to densely hairy. Leaves concolorous to slightly discolorous, with recurved margins, if strongly discolorous then tepals caudate; ovules 1 or 2. Leaves usually remaining green or turning brown on drying, usually straight; tepals and young branchlets moderately to densely covered in grey to rusty hairs; ovule usually 1. Inflorescences mostly growing on into a leafy shoot or if mostly terminated by a dormant bud then tepals moderately hairy; tepals apiculate to caudate. Single-stemmed shrubs to small trees 1.5–9 m high. 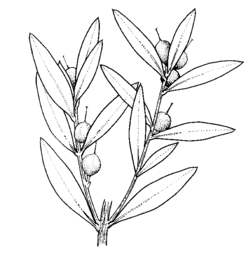 Leaves 10–45 mm wide, 1.5–7 times longer than broad; bark reticulately fissured at base, smooth on branches. Tepals prominently caudate; leaves mostly 3–7 times as long as broad. Leaves >15 mm long, either incurved or not consistently curved. Leaves alternate, concolorous to slightly discolorous; tepals glabrous to densely hairy. Pedicels 1–12 mm long, erect to recurved, glabrous to densely hairy; combination never as above. Spreading to erect shrubs to trees or rarely decumbent to prostrate shrubs; tepals mostly 10–13 mm long (rarely 9 mm in P. sericea and then mature leaves sparsely to densely hairy, habit erect), obtuse to caudate with terminal tails; mature leaves densely hairy to glabrescent. Mature leaves glabrescent or rarely sparsely to moderately hairy but then broadest at or below middle, 2–14 cm long; pedicels erect. Young branchlets and tepals densely or sometimes moderately hairy; hairs mostly spreading; pedicels 1–4 mm long. Young branchlets, young leaves, pedicels and tepals greyish- to tawny-hairy or if rusty-hairy then ovary sparsely hairy; mature leaves smooth to slightly scabrous, glabrescent to sparsely hairy. Inflorescences usually mostly growing on into a leafy shoot or if mostly determinate then tepals moderately hairy, apiculate to caudate. Single-stemmed shrubs to small trees 1.5–9 m high; ovary sparsely to densely hairy. Tepals moderately to densely covered in moderate length antrorse to spreading hairs. Tepals apiculate to shortly caudate; ovary usually moderately to densely hairy; leaves mostly 2–3.5 times as long as broad.